We are debating when Amanda's belly button will switch from an innie to an outie. My guess is around August 1st. Amanda is guessing never - instead it will become a flatie. Leave your best guess in the comments section. The closest to the correct date wins a prize! I will go with July 31st. 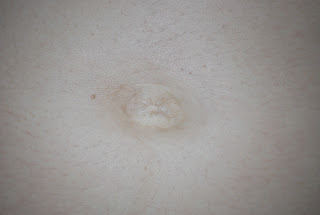 THe belly button will peak its little head outside it usual innie position and start to become an outie. I figured I would underbid you by 1 day. It is like the dollar bid on the prices is right. My bet is on a flatie...that's where I'd place my money.